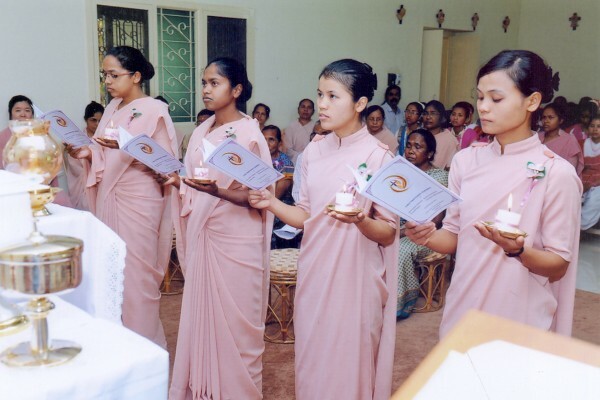 This year the Indian provinces are blessed with the four newly professed sisters Mercyriana ‘D’ Marak, Promila Toppo, Rajnita Dung Dung and Vernaleen Mary Mawkon. We thank God for the gift of life and the vocation of these four sisters who generously responded to God’s call saying “To you belong my life entire”. Indeed the 2nd of February was a day of joy. 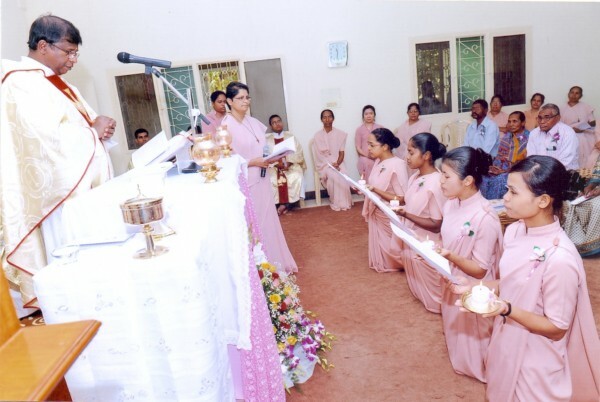 The joyous bells of first profession were ringing in Bangalore South India Novitiate. 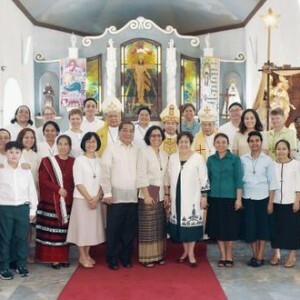 We were blessed indeed with the presence of the parents and relatives of our four sisters, who travelled far and wide to witness the first profession of their daughters. To some it took four days to arrive in Bangalore. The tears of joy flooded from their eyes as they met for the first time after two years. 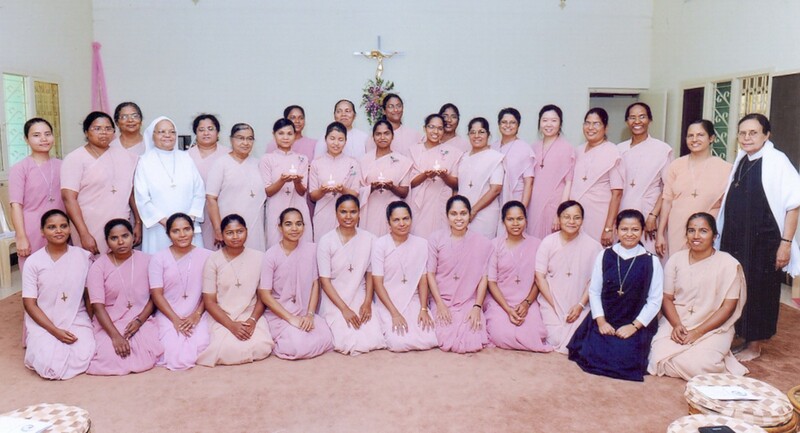 We greatly appreciate the presence of Srs Lissy Sebastian who received the vows and Ly Thi Bich Quyen the formation in charge and Congregational liaison of India south province. We had our friends, neighbors, and well wishers’ to grace this occasion. Their presence added immense joy to the ceremony. Rev.Fr. Pedro Camilo Simoes SAC the provincial of ABVM province Bangalore was the main celebrant, who is elected for the third term. 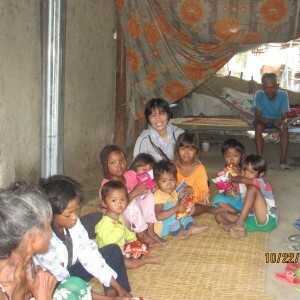 The celebration was simple but very meaningful. There were twelve priests from different congregations who concelebrated. During the Eucharistic celebration, Rev. Fr. Pedro Camilo inspired us with his homily in which he spoke that the religious commitment is like a marriage where we get engaged with Jesus, having known him closely. He encouraged us to deepen our relationship with Jesus through prayer and by being faithful to him. While we live the three vows we need to be watchful not to be trapped and deceived by the temptations of this world. He concluded with the words of Pope Francis “Wherever consecrated people are, there is always JOY”. He encouraged the four newly professed and the consecrated people to be a joyful and life giving religious wherever we are. With gratitude in our hearts, we extend our thanks to the CLT and PLTs of Indian provinces and all the sisters in the Congregation for your support and encouragement.